MOST ATTITUDE OF THE TURTLES: Raphael can use Charge and Flurry. HEY! 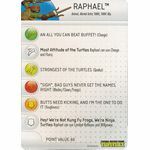 WE'RE NOT KUNG FU FROGS, WE'RE NINJA TURTLES: Raphael can use Combat Reflexes and Willpower. This item is not supplied with a card. This item is not supplied with a miniature. 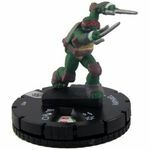 MOST UNPREDICTABLE OF THE TURTLES: Opposing characters can't use Probability Control to reroll attacks made by or targeting Michelangelo. 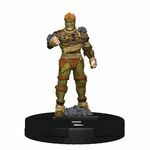 SPIN ATTACK: Michelangelo can use Quake. When he does, after actions resolve give each hit character an action token. 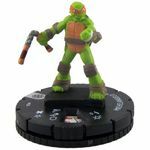 MOST ENDURANCE OF THE TURTLES: Michelangelo can use Combat Reflexes and Willpower. MY BO... CONVERTS TO A NAGINATA: Giant Reach:3. 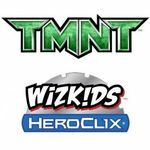 Donatello can use Blades/Claws/Fangs, but only if he's attacking a non-adjacent character. TWIN KATANAS: Leonardo can use Blades/Claws/Fangs. When he makes a close attack, he can use Probability Control. 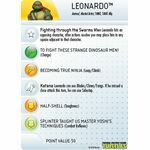 ANALYZE AND COUNTER FIGHTING STYLES: Leonardo can use Super Senses and Toughness. 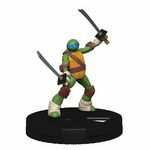 LEADER OF THE TURTLES: Leonardo can use Leadership. 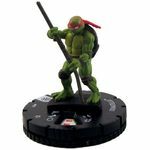 When he does and succeeds, he may instead remove an action token from each adjacent friendly character with the TMNT keyword. ALL FEAR ME... ALL EXCEPT THE RATS: At the beginning of your turn, if Rat King occupies or is adjacent to hindering terrain, place adjacent a Giant Rat bystander if less than 4 are on the map. STRANGE SPECTRAL GUIDE: When Rat King is KO'd, you may equip him to a friendly character with the Animal keyword. The equipped character can use Probability Control. If the equipped character is named Splinter, he can use Regeneration. 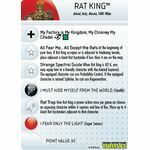 RAT TRAP: Give Rat King a power action once per game and choose an opposing character within 4 squares and line of fire. Place up to 4 Giant Rat bystanders adjacent to that character. 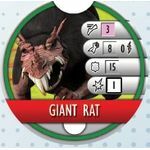 SWARM OF RATS: If Giant Rat is adjacent to one or more friendly bystanders named Giant Rat, modify its damage value by +1. If it's adjacent to two or more of them, also modify its attack value by +1.